The CSIRO has helped develop a new type of wheat that it says has 10 times the amount of fibre than regular wheat. Created in conjunction with other organisations, the wheat is high in a resistant starch called amylose. Principal CSIRO Research Scientist, Dr Ahmed Regina, said products made from high-amylose wheat contained more than ten times the resistant starch, a type of dietary fibre, than those made from regular wheat. Work on the wheat first began in 2006 when the CSIRO, a French company called Limagrain Céréales Ingrédients and the Grains Research and Development Corporation started working on the project under a company called Arista Cereal Technologies. The first US crops of the wheat have just been harvested in Idaho, Oregon and Washington. It is expected the wheat will be used in a range of US sold food products that will be sold in supermarkets in coming years. The US-based Bay State Milling Company was the first company to licence the rights to grow the wheat that they will sell under the name HealthSense high fibre wheat flour. 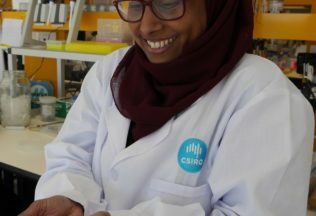 Lindsay Adler from CSIRO and an Arista Director, said Arista was keen to find an Australian licensee who would develop a new product for local and possibly also Asian markets. “This is an opportunity ripe for the picking, with customers across the world increasingly demanding foods with improved health benefits,” Adler said. Arista is already partnering with a breeding company to develop high-amylose wheat varieties suitable for different regions. Peters Ice Cream Australia is now selling ice cream tubs inspired by Nestle confectionary brands. Vitasoy has launched a new soy milk called ‘2 Beans’.